Lothaire Bluteau in a publicity still from the 2010 Alliance Vivafilm release, L’enfant prodige. 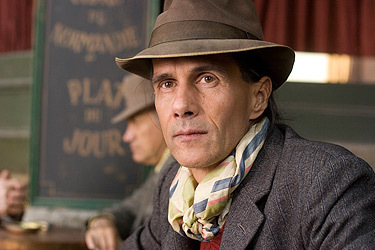 Bluteau was born into an impoverished family of nineteen and grew up to become an award-winning stage actor in Montréal. He had made a number of small movies when he was cast by Denys Arcand as the theater director obsessed with modernizing a staging of the Passion in the 1989 film, Jesus of Montreal. He was given a Genie Award for his powerful performance, a performance usually described as a major breakthrough for his career. Back in theatre he made his London stage debut in 1991 as a murderous gay hustler in Being at Home with Claude. That year also saw him play a French Jesuit missionary making a harrowing journey to a remote mission outpost in Bruce Beresford`s feature, Black Robe. He was nominated for the AFI Award for Best Actor for his work on Black Robe and won the award for Best Actor at the 1997 Gijón International Film Festival for his work on Bent. He appeared in The Tudors as Ambassador Charles de Marillac.